Mount Everest Base Camp: Check. They say one should never prematurely reveal the ending of a story, lest your readers lose interest and not read your writings that lead up to said ending. Nevertheless, it will take me a while to get all of my experiences and stories from the last 15 days of trekking properly compiled, written, and edited for public consumption that I thought, what the heck – I’ll just quickly relish in this tiny bragging right I’ve earned myself and tell you that…. I MADE IT TO MOUNT EVEREST BASE CAMP! Yes I did. All 5,364m of it. As of today my astounding trekking trip has come to an end, but at this moment I am still within the mountains; a more civilized section of it, complete with overrated-coffee-chain dopplegangers offering free Wi-Fi for an overpriced cup of coffee, that city-establishment-deprived tourists like me happily pay for. My dad and I have our flight back to Kathmandu arranged for tomorrow morning, after which we will plan on our subsequent flight home. Tags: Everest, Everest Base Camp, Father-Daughter Trips, Hiking, Himalayas, Kathmandu, Nepal, Personal Achievements, Travel, Trekking. Bookmark the permalink. Really looking forward to read about your experiences there. 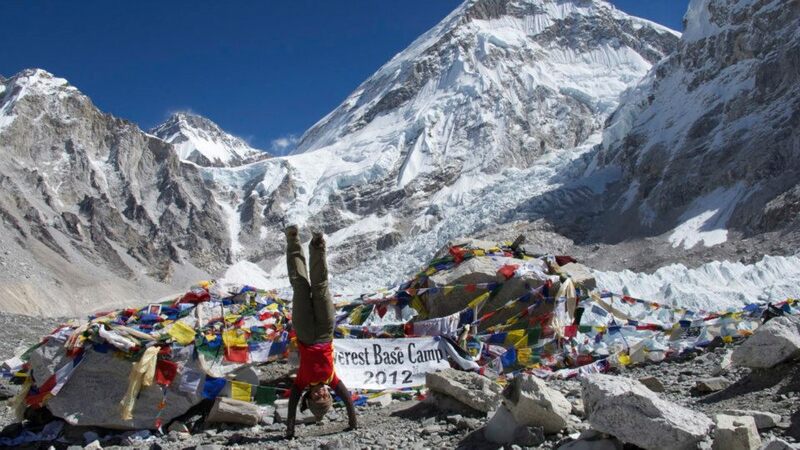 Doing research on the everest base camp trek I’ll hopefully be doing this year and for some reason this photo just sticks out of all the google searches LOL. Good stuff, hope to see a more detailed entries. First, I have to apologize I’m only just reading your comment a whole three-quarters-of-a-year-later! Been a bit of a lousy blog-owner, abandoned it for a while and only just logged back in to try and kickstart things again. Anyhow, lol about this photo sticking out amongst Google searches! Didn’t think about that when I posted it but I guess it must (hand)stand out a bit huh? Haha. Thanks for dropping by the blog… I’ve totally failed at posting up anything I’d written in draft about my Everest Base Camp trip though – they’re all sitting in raw, unfinished bits and pieces in my drafts page, unfortunately. Tsk tsk.